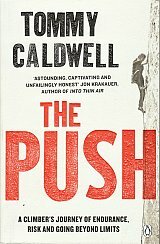 A dramatic, inspiring memoir by legendary rock climber Tommy Caldwell This engrossing memoir chronicles the journey of a boy with a fanatical mountain-guide father who was determined to instil toughness in his son to a teen whose obsessive nature drove him to the top of his sport. But his evolution as a climber was not without challenges; in his early twenties, he was held hostage by militants in a harrowing ordeal in the mountains of Kyrgyzstan. Soon after, he lost his left index finger in an accident. Later his wife, and main climbing partner, left him.